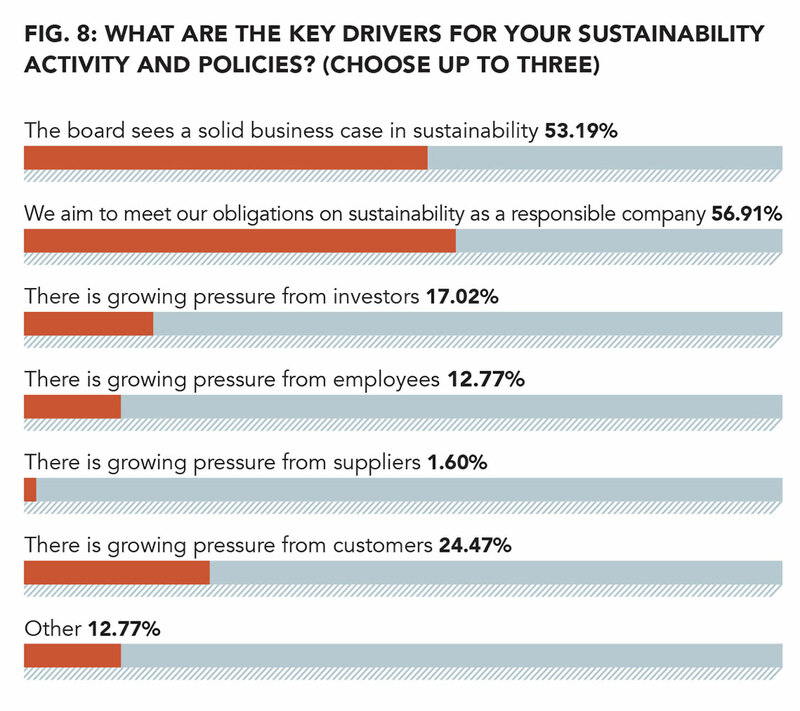 Board members are confident that they understand the importance of addressing sustainability, but a new survey also reveals that leadership teams are still grappling with how to build the right policies and information to ensure they are meeting the challenge head-on. 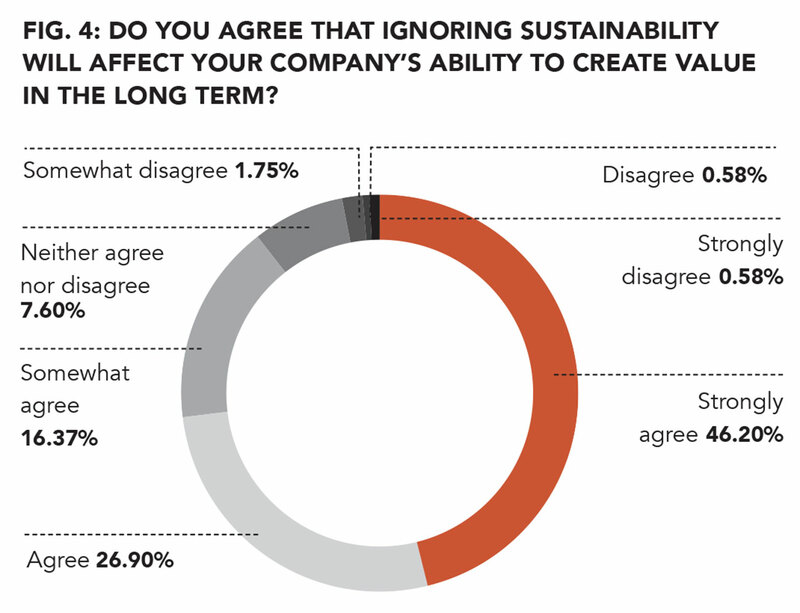 A survey conducted by Board Agenda found that 73% of European businesses either strongly agree, or agree, that ignoring sustainability would affect their company’s ability to create long-term value (Fig. 4), a clear signal that the issue is high on the agendas of many boardrooms. 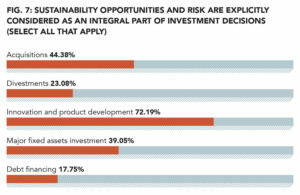 More than half (58%), of the 234 respondents also said their boards had a clear understanding of the risks and opportunities embodied in sustainability (Fig. 6). 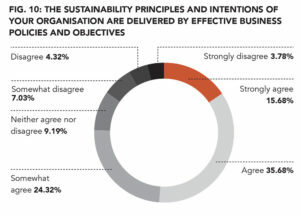 More than half again (53%) said they see a clear business case for sustainability, while 57% say they aim to meet their sustainability obligations. The news will be encouraging to those who have campaigned to place sustainability at the heart of business. Earlier this year a new UK Corporate Governance Code placed sustainability central to board responsibilities, with Provision 1 of the code asking leadership teams to disclose in annual reports “the sustainability of the company’s business model”. Elsewhere, the Intergovernmental Panel on Climate Change has laid bare the challenge facing businesses and their ability to adapt to global warming, saying that “few” were currently prepared if the world is to limit warming to no more than 1.5° above pre-industrial levels. 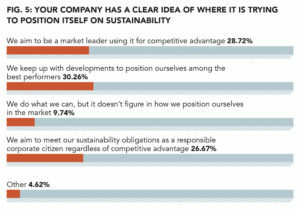 But while the survey, conducted in conjunction with professional services firm Mazars and business school INSEAD, gives rise to some optimism about the corporate world’s ability to integrate sustainability into the management of their companies, there are signs that the tools to do it may not yet be fully evolved. While the risks and opportunities appear to be understood, half could not say that their sustainability intentions were delivered by effective business policies. A quarter of respondents could only partially agree that their policies served sustainability, while a worrying 15% indicated that their policies may not be up to the mark (Fig. 10). 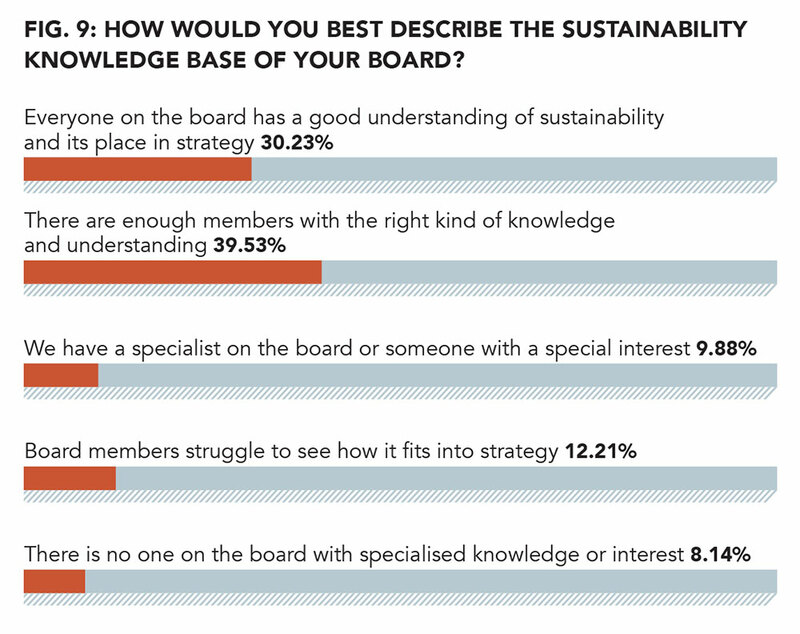 Sustainability knowledge in boardrooms appears to be good, with more than two-thirds (69%) saying they had a “good understanding” or “enough” people with the right kind of knowledge (Fig. 9). 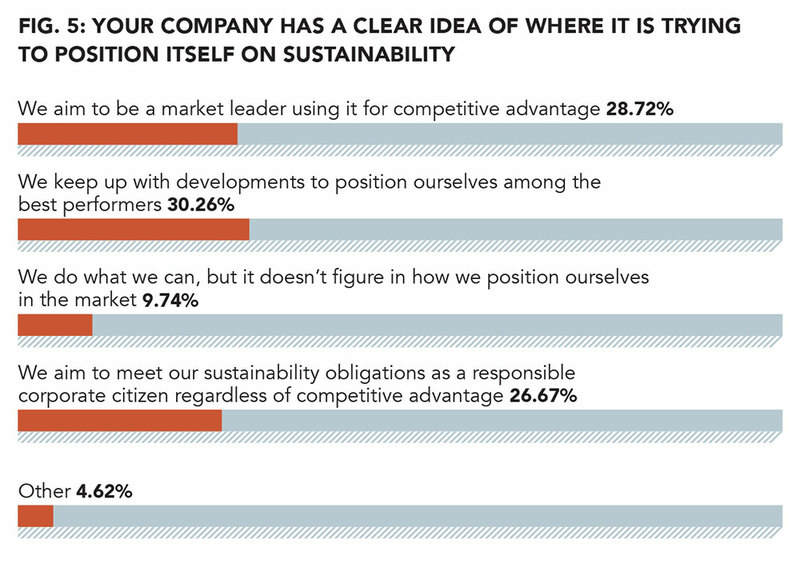 An alarming 12% said they struggle to see how sustainability fits into their strategies. And while there is recognition that sustainability will affect the long-term prospects of business, only one-third of respondents could say the topic had been integrated into performance measures and compensation schemes for executive board members. Half emphatically said it had not. 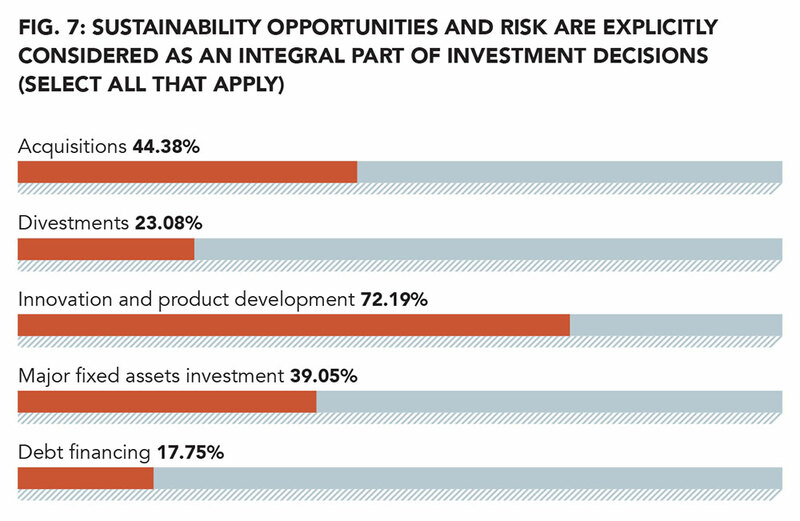 This is fascinating when considered against figures that reveal that sustainability opportunities and risk are explicitly considered in key business activities such as innovation and product development (70%), acquisitions (44%) and fixed asset investment (39%) (Fig. 7). 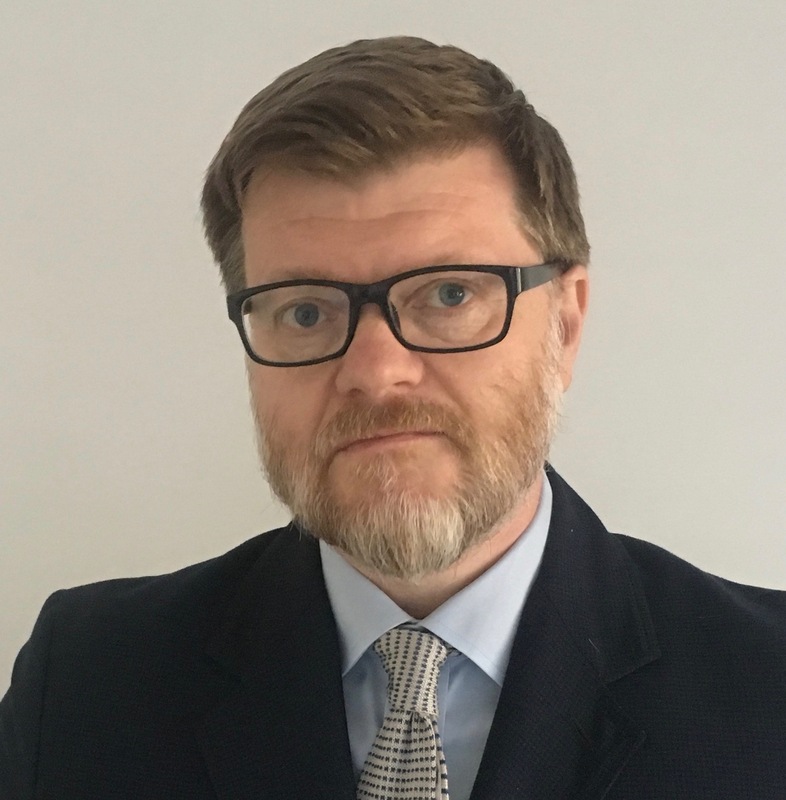 Craig Smith, professor of ethics and social responsibility at INSEAD, said: “It is encouraging to see in the survey findings widespread recognition of the importance of business attention to sustainability and of the significant risks to businesses that fail to give it sufficient attention,which makes sustainability a critical board issue. “The results of the survey are positive and insightful. 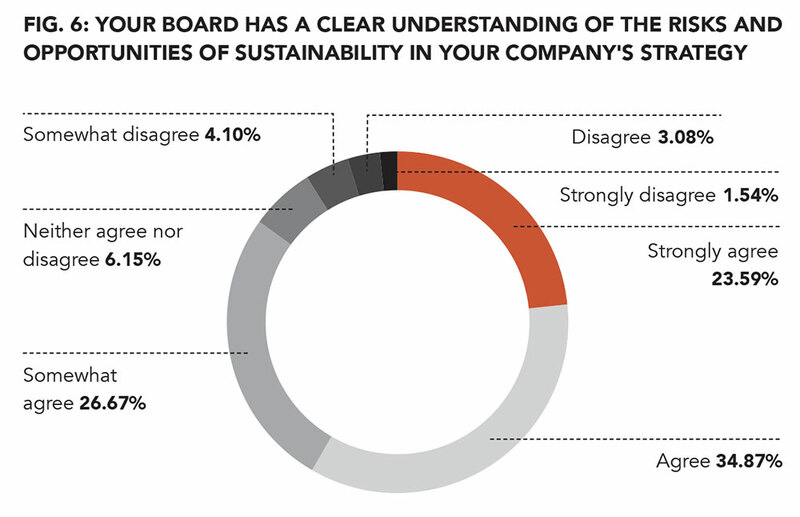 They demonstrate that boards have sustainability front and centre in their minds as a key strategic consideration, and they recognise that it has a very significant impact on their companies’ ability to create long-term value. “It seems equally clear, however, that more work is needed by boards to make sure that they have the infrastructure in place within their businesses and in the boardroom to drive reliable and useful non-financial reporting, and to manage their long-term sustainable performance effectively. 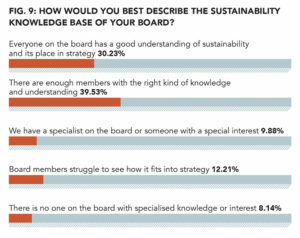 It is very encouraging that almost 30% of boards are aiming to be market leaders in sustainability, with a further 30% seeking to be seen as strong performers. “Similarly, while recognising it is a self-assessment, about 60% of respondents consider their boards to have a clear understanding of the risks and opportunities related to sustainability in their company’s strategy. Yet only 50% of respondents have a firm conviction that they have the right information and measures in place to help them understand their companies’ position, ambition and progress on sustainability. “Moreover, in terms of how boards maintain sustainability oversight, only 17% said their boards had a dedicated sustainability committee, with just 5% having a dedicated non-executive director fulfilling this function. Likewise, only 35% fully agreed that sustainability expertise or a sustainability mindset are explicit selection criteria in the appointment of either executive or non-executive board members. 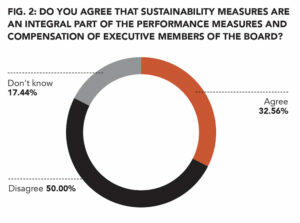 A similarly low proportion, 33%, agreed that sustainability measures are an integral part of the performance measures and compensation of executive board members. 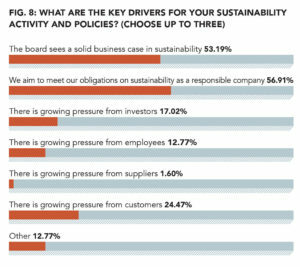 It is also surprising that boards do not see pressure from investors and employees as key drivers for their sustainability activity. 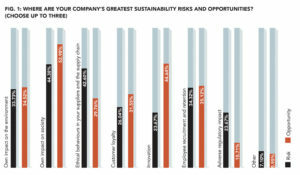 “This research into leadership in corporate sustainability clearly shows that the subject is rising up the business agenda. Driven by a developing societal awareness, companies face growing demands, if not pressures, to conduct their business sustainably. These come from stakeholders such as consumers, investors, national governments and NGOs, and have been articulated in international documents and agreements, of which the UN Sustainable Development Goals have gained particular prominence. 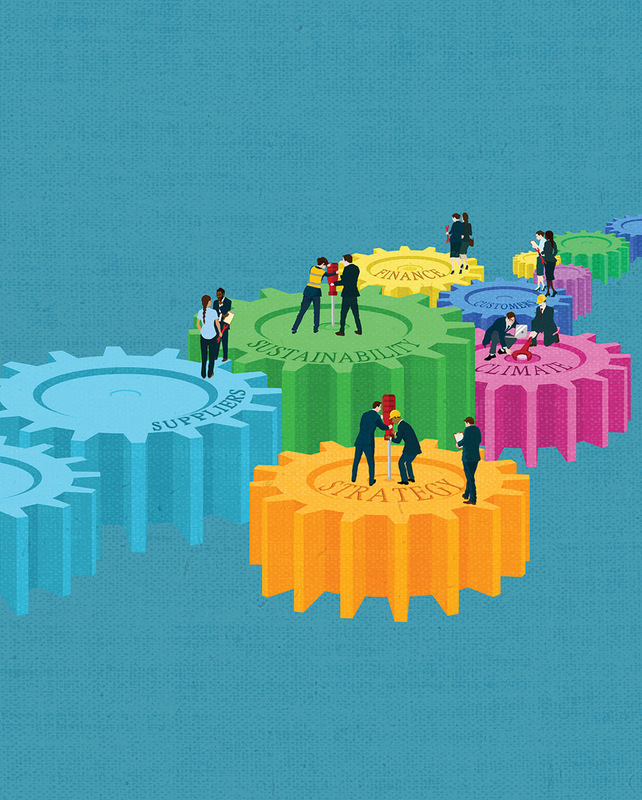 “But to keep up with these ever-increasing demands, it is not enough for boards to just be aware of and express a commitment to sustainability. What was good enough yesterday is no longer sufficient today. For example, a company being eco-efficient and socially responsible in its own operations is no longer doing enough. 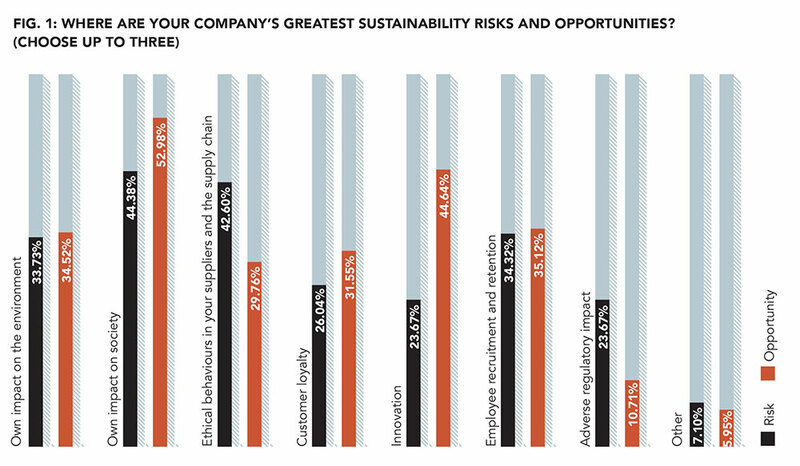 Often firms must address the sustainability of their supply chains as well. “Sustainability is increasingly associated with basic questions of company purpose, core product offerings, business models and innovation, and what value creation means to the organisation. These considerations demand the attention, drive, and decision-making of the board. Simply put, if an issue is not on the board’s agenda, it is unlikely to be at the heart of an organisation’s strategy, culture or governance. “A lack of board attention to sustainability is short-sighted, if only as a matter of good governance, not least with institutional investors also looking at sustainability policies in a more holistic way. The findings of this research must inevitably be judged with regard to the representativeness of the participants and the potential for social desirability bias in their responses. “That said, it is surely encouraging to find strong evidence within this sample of substantial board awareness of the importance of sustainability. Yet the research also shows that boards still struggle to get the right information, expertise and processes in place to address sustainability issues effectively. For instance, only around a third of participants agreed that a sustainability mindset was an explicit selection criterion in appointing board members and senior executives, and only a third reported that sustainability was an integral part of the performance measures and compensation of executive board members. Download the full report, Leadership in Corporate Sustainability—European Report 2018. Thomas Albanese, Guy Elliott and Rio Tinto face a civil charge of fraud by the SEC over alleged failure to inform markets of plummeting asset values. Elliott also quits the Royal Dutch Shell board. Engineering company's executive pay proposal provokes public ire and displeasure of Canadian prime minister.